It’s hard work being a tourist. You need to eat and drink. 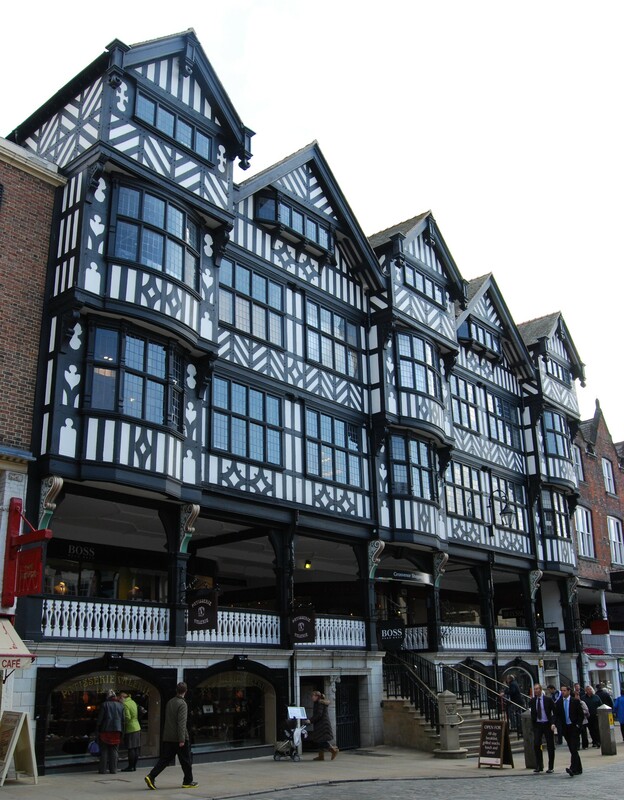 When my mate Richard and I explored Chester recently, we had reasonable coffee in splendid surroundings at the Queen Hotel, directly opposite the railway station: http://www.feathers.uk.com/premier-queen-hotel. At lunchtime we had a pit-stop at a branch of Patisserie Valerie on Bridge Street: http://www.patisserie-valerie.co.uk/chester-cafe.aspx. This is a dependable food-chain experience, very French – so French, in fact, that I felt compelled to text my Francophone friend John to find out that ‘framboises’ means ‘raspberries’. It’s a male thing, not liking to ask. By teatime we’d reached Chester Cathedral. 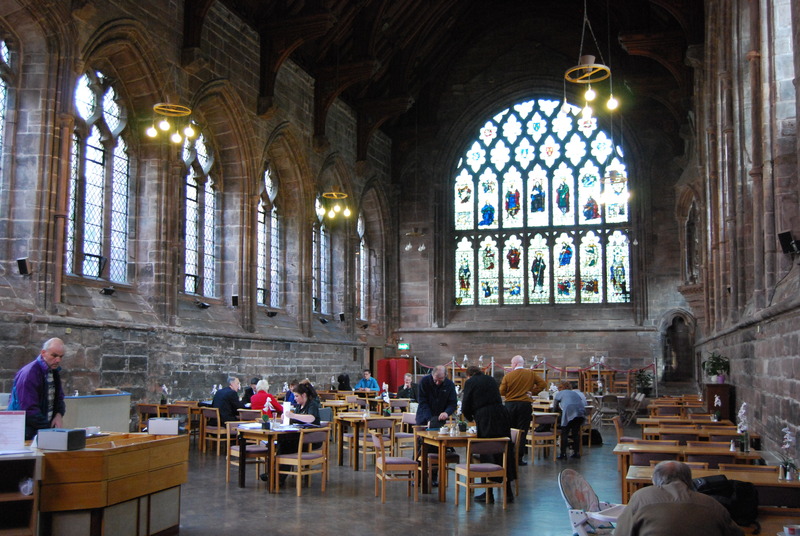 We both take exception on principle to having to pay admission to a place of worship, but we’re more than happy to pay good money for superb cakes, tea and coffee in the Refectory Café: http://www.chestercathedral.com/chester-cathedral-refectory-cafe-opening-hours.htm. Richard is adept at real-beer research, so by 5pm opening-time we were at the door of The Albion [http://www.albioninnchester.co.uk], where we put away a couple of pints of a beer called Flying Scotsman (“hints of raisiny spiciness and toasty dryness. Fresh, slightly citrus tang with a rich rounded finish” – http://www.caledonianbeer.com/flyingscotsman.htm) while gazing at evocative enamelled advertisements for Colman’s Starch “sold in cardboard boxes”, the Public Benefit Boot Co [http://freepages.genealogy.rootsweb.ancestry.com/~publicbenefit] and one with the reassuring strapline that “Craven ‘A’ will not affect your throat”. For our evening meal we hiked back towards the station to the canal-side Old Harkers Arms [http://www.brunningandprice.co.uk/harkers], named after the chandler whose warehouse became a pub in the late 1980s. Here we drank Great Orme Celtica (“full of citrus taste and aroma – http://www.greatormebrewery.co.uk/cask_cd.htm) and I ate an excellent steak-and-ale suet pudding. We saw some buildings too. This entry was posted in Historic Chester, Life-enhancing experiences on January 17, 2014 by Mike Higginbottom. St John’s Church, Chester, which lies outside the city walls near the half-exposed Roman amphitheatre, looks to all practical purposes Victorian, though with a ruined east end that has to be older and a stump of a tower in south-west corner. When you step inside, the fine Norman interior comes as a surprise. It has an architectural feature unique among English churches – the nave arcades have a barely perceptible but deliberate outward lean – and there is a noteworthy wall-painting of St John the Baptist on one of the columns. This church was from 1075 until 1102 the cathedral of the former diocese of Lichfield, and even after the see was transferred to Coventry, St John’s remained a nominal cathedral within what was known as the diocese of Coventry and Lichfield until the Reformation, when the nave became a parish church and the east end was left to ruin. You can see in the Norman architecture exactly where the bishop’s departure interrupted the building programme: the nave triforium and clerestory are anything up to a century newer than the arches on which they stand. Although the Victorian architect R C Hussey had carried out a restoration in 1859-66, the mainly sixteenth-century north-west tower collapsed in 1881. 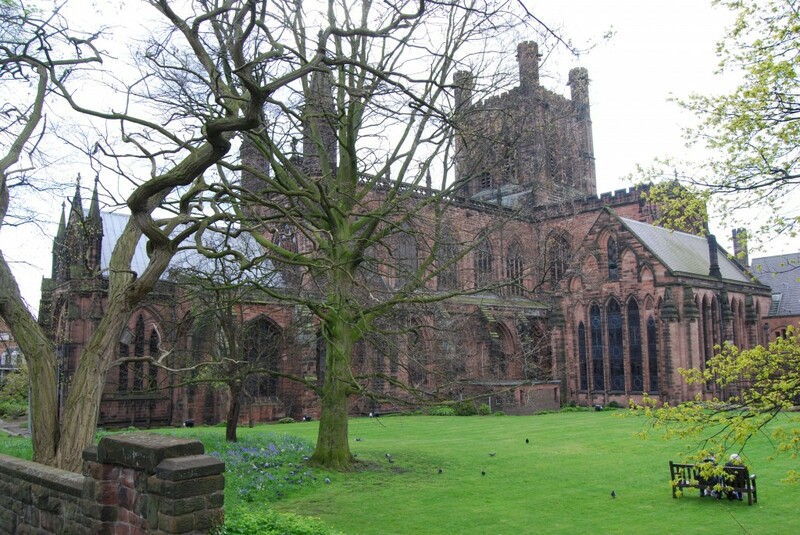 The Chester architect John Douglas rebuilt the north porch, leaving the ruins of the Norman choir and Lady Chapel and the fourteenth-century choir chapels. Most historic buildings are a palimpsest – a document repeatedly erased and rewritten – but St John’s has suffered more alterations than most. St John’s Church is open daily for visitors and worshippers. No admission-charge is levied, and donations are welcomed: http://www.parishofchester.com/donations.html. 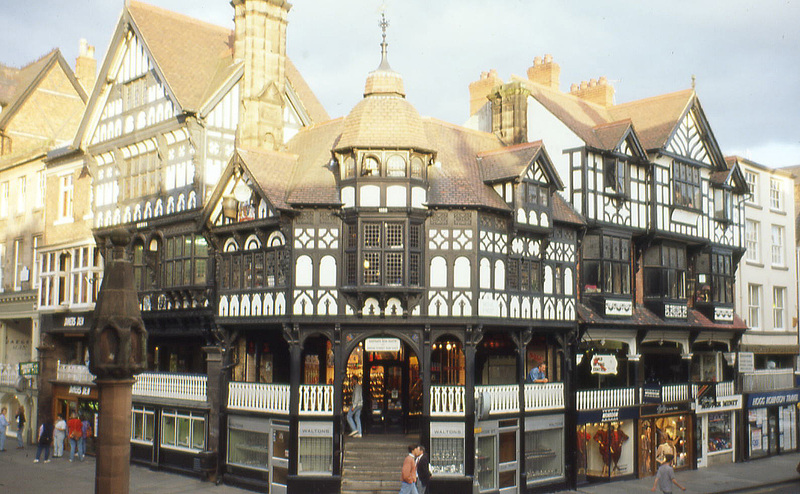 This entry was posted in Historic Chester, Sacred Places, Survivals & Revivals: past views of English architecture, Victorian Architecture on January 13, 2014 by Mike Higginbottom. The present building was begun in 1092 and then remodelled and enlarged from the late thirteenth century onwards: the later generations of builders kept their work in harmony with their predecessors, as did their contemporaries at Westminster Abbey and Beverley Minster. Its exterior has been so repeatedly and heavily restored, by Thomas Harrison (1818-20), R C Hussey (from 1844), Sir George Gilbert Scott (from 1868) and Sir Arthur W Blomfield (after 1882), that it’s difficult to be sure if any of the visible fabric is earlier than the nineteenth century. Certainly the apse at the end of the south choir aisle, with its exaggerated roof, is pure Scott. 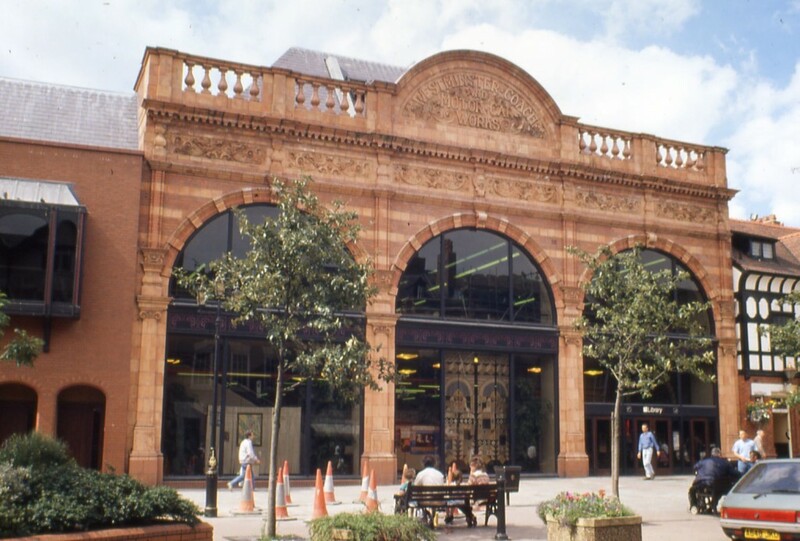 This most notorious of the Victorian “Scrape” school of restorers, obsessively committed to tidying up and purifying the style of medieval churches, was heavily criticised for his work at Chester, yet some of his contributions, such as the choir screen and its wrought-iron gates (1876) are now highly-regarded designs in their own right. He was not the only author of Victorian depredations: Dean Howson, regrettably, ordered the removal of five medieval misericords, of which the subject-matter was considered to be “very improper”. Ironically the medieval shrine of St Werburgh survived the Reformation because the base was used for the Bishop’s throne. 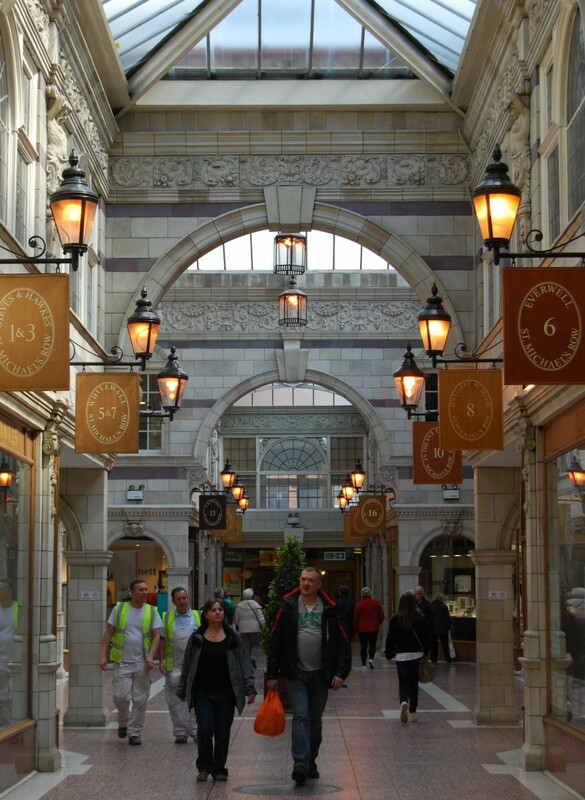 Sir Arthur W Blomfield restored it as best he could in the late Victorian period. The Chapter House, described by Pevsner as “the aesthetic climax of the cathedral”, dates from the thirteenth-century, but was restored by R C Hussey in the mid-nineteenth century. Similarly, the south side of the cloisters is a reproduction by Sir George Gilbert Scott. The refectory, still with its monastic pulpit, has an east window by Giles Gilbert Scott, installed in 1913, and the roof is by F H Crossley, completed in 1939. In contrast, the most modern, uncompromising yet least obtrusive addition to the Cathedral is the Addleshaw Tower, a detached bell-tower by George Pace, completed in 1972-4, after the old bell-frame in the central tower was found to be beyond safe restoration. So Chester Cathedral looks now like it never did in the past. This is true of most ancient buildings. I think this complexity makes it all the more interesting, once you know what you’re looking at. Chester Cathedral operates as a tourist attraction, charging for entry outside service-times: http://www.chestercathedral.com/chester-cathedral-visiting-opening-hours.htm.